We are now offering Acupuncture Happy Hour every Thursday from 4-6pm! Learn about the benefits of acupuncture by experiencing it first hand. 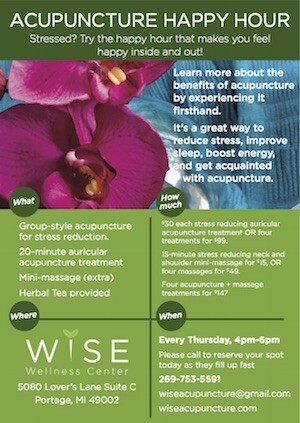 It’s a great way to reduce stress, improve sleep, boost energy and get acquainted with acupuncture. If you are curious about acupuncture and have been wanting to try it, this is a great time to check it out and see how powerful this medicine can be. We are offering these amazing acupuncture treatments for: $30 each or $99 for a package of 4. Mini head and neck massage: $15 each or $49 for a package of 4 Both the mini acupuncture and massage sessions: $147 for package of 4 treatments. Please call for a reservation as they fill up fast! Check out our ad in Women’s Lifestyle Magazine of Greater Kalamazoo!